We describe a rapid, molecular-based Influenza A and B assay. The Influenza assay detects each target within 15 min by employing isothermal amplification with influenza-specific primers followed by target detection with molecular beacon probes. The Influenza A and B assay is user-friendly and required minimal hands-on time to perform. Otto, C. C., Kaplan, S. E., Stiles, J., Mikhlina, A., Lee, C., Babady, N. E., Tang, Y. W. Rapid Molecular Detection and Differentiation of Influenza Viruses A and B. J. Vis. Exp. (119), e54312, doi:10.3791/54312 (2017). Influenza is a contagious respiratory illness caused by influenza viruses A and B in humans and causes a significant amount of morbidity and mortality every year. The Influenza A and B assay was the first CLIA-waived molecular rapid flu test available. 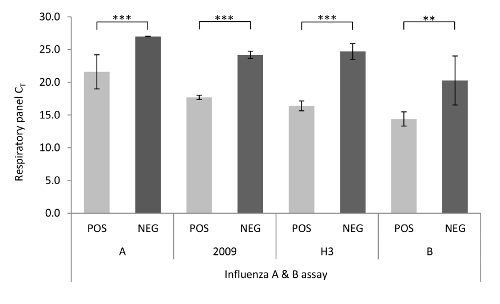 The Influenza A and B test works by employing isothermal amplification with influenza-specific primers followed by target detection with molecular beacon probes. Here, the performance of the Influenza A and B assay on frozen, archived nasopharyngeal swab (NPS) specimens stored in viral transport medium (VTM) were compared to a respiratory panel assay. The performance of the Influenza A and B assay was evaluated by comparing the results to the respiratory panel reference method. The sensitivity for total influenza virus A was 67.5% (95% CI (CI), 56.6-78.5) and the specificity was 86.9% (CI, 71.0-100). For influenza virus B testing, the sensitivity and specificity were 90.2% (CI, 68.5-100) and 98.8% (CI, 68.5-100), respectively. This system has the advantage of a significantly shorter test time than any other currently available molecular assay and the simple, pipette-free procedure runs on a fully integrated, closed, small-footprint system. Overall, the Influenza A and B assay evaluated in this study has the potential to serve as a point-of-care rapid influenza diagnostic test. Influenza virus infections result in a significant amount of morbidity and mortality each year1,2,3. Uncomplicated influenza is characterized by constitutional and respiratory symptoms such as fever, myalgia, headache, and non-productive cough4,5. Older individuals, young children, immunocompromised patients, and patients with underlying comorbidities are at a higher risk for serious complications such as pneumonia, myocarditis, central nervous system disease, or death6,7. Influenza infection is unique from other respiratory viruses in that prompt administration of antiviral therapy within 48 h of symptom onset can reduce the disease severity and length8. Rapid identification of influenza has also been shown to reduce the use of unnecessary antibiotics9,10. Further, hospitalized patients with influenza infections must be placed in isolated rooms with appropriate infection control precautions. However, respiratory illnesses caused by non-influenza viruses can be difficult to clinically distinguish from influenza. For this reason, rapid and accurate diagnostic testing for influenza is very important for clinical patient management. Several assays are available for the detection and identification of influenza viruses. Rapid influenza antigen detection tests (RIDTs) are widely used in clinical practice as point-of-care tests because they are simple to use and provide results within 15 to 30 min11,12; however, their sensitivities vary widely (10-80%) depending on the manufacturer and the population being tested, and the influenza type and subtype13,14,15. Direct fluorescence assays (DFAs) provide superior sensitivities over RIDTs, but the processing time is greater (~3 hr) and must be completed by skilled technologists16,17. Viral culture has been the gold standard for influenza diagnostics and has improved sensitivity over both RIDTs and DFAs18. However, influenza viral culture can take anywhere from 2-14 d to complete, diminishing its utility in aiding patient management19. Lastly, nucleic acid amplification tests (NAAT) have replaced culture techniques as the new gold standard in influenza diagnostics. NAAT are considered to have the greatest sensitivity for detecting influenza in a few hours. However, NAAT are the most expensive assays and require specialized equipment and technologists to perform5,20,21,22,23,24,25. The influenza A and B assay described here is the first CLIA-waived molecular rapid flu test that is readily available. This assay works by employing a Nicking Endonuclease Amplification Reaction (NEAR) that uses isothermal amplification with influenza-specific primers followed by target detection with molecular beacon probes. This assay differentiates influenza A from B, requires 2 min to set up and process one sample, and requires a total of 15 min to complete. Here, we present the protocol for the Influenza A & B assay. In addition, we provide a sample data set comparing the performance of the Influenza A and B assay on archived nasopharyngeal swab (NPS) specimens stored in viral transport medium (VTM) to another respiratory pathogen panel assay. ETHICS STATEMENT: The use of left-over clinical specimens is approved and follows the guidelines of the Memorial Sloan Kettering Cancer Center Institutional Review Board. NOTE: The Influenza A and B assay is approved for nasopharyngeal swab specimens and for nasopharyngeal swabs stored in viral transport media. Swabs are included in the kit and should be used for optimal performance. However, rayon, foam, flocked swabs or polyester nasal swabs can also be used to collect nasal swab samples. To collect a nasal swab sample, insert the swab into the nostril that has the most visible drainage or that is most congested. With gentle rotation, push the swab into the nostril until resistance is met and rotate several times against the nasal wall before slowly removing from the nostril. Store the swabs and transport them in vials containing 3 ml of viral transport media (VTM). NOTE: Careful attention to appropriate specimen collection must be taken as inadequate specimen collection may yield erroneous results. NOTE: Swab specimens should be tested as soon as possible after collection. However, they may be stored at room temperature for up to 2 hr or refrigerated at 2-8 °C for up to 24 hr if testing is not immediately available. Freshly collected specimens are ideal for optimal test performance. Improper sample handling, storage, and/or transport may yield erroneous results. NOTE: As a precautionary measure, individuals performing this test should treat all specimens as potentially infectious by following universal precautions when handling specimens. Bring all samples to room temperature prior to testing. NOTE: All test components are for a single use only and should not be used to perform multiple tests. Do not mix kit components from different lot numbers. Do not use kit reagents past their expiration date. Bring the blue sample receiver to room temperature prior to testing. The orange test base can be tested without the need to warm to room temperature. To begin the test process, touch 'Run Test' on the instrument screen. Enter the patient ID by using on-screen keyboard or barcode scanner and press 'OK.' Open the lid and insert the Orange test base into the Orange test base holder. Confirm that the correct test is displayed on the screen and press 'OK.' Insert the blue sample receiver into the blue sample receiver holder. NOTE: Do not open the sample receiver before placing in the instrument as this will prevent the elution buffer from reaching the correct operating temperature and may impact test performance. Wait for the sample receiver to warm up. When prompted by the instrument, remove the foil seal and place the patient swab to be tested into the sample receiver. NOTE: When removing the foil, place two fingers on the edge of the Sample Receiver to ensure that it stays in place. Vigorously mix the swab in the liquid for 10 sec, pressing the swab head against the side the sample receiver as you mix it to help dislodge the specimen from the swab. Press 'OK' to proceed. If testing swabs stored in viral transport medium, vortex the VTM for 10 sec then add 200 µl to the sample receiver. Press the white transfer cartridge into the blue sample receiver. Continue pressing on the sample receiver until the orange indicator rises. Lift and then connect the transfer cartridge to the test base. Observe the orange indicator descend once the cartridge transfer is attached correctly. Close the Lid and do not open until the "Test Complete" message appears on the screen. Touch 'Run QC Test' on the home screen. Select the QC Test to be Run. Confirm the test type to match the QC sample intended for testing by touching 'OK' and following the on screen prompts to complete testing. After the test run is complete, observe the results of the test displayed on the screen with interpretations for the presence of Influenza A, B, unknown subtypes. For invalid results repeat the test. Clean the instrument and the surrounding bench area daily with 70% ethanol or 10% bleach solution. Spray the cleaning solution on a damp, lint-free cloth to clean. Do not pour the solutions directly on the instrument. In this study, archived NPS specimens were collected from inpatients presenting with influenza-like symptoms at Memorial Sloan-Kettering Cancer Center (MSKCC) during an influenza outbreak between December 15, 2012 and March 1, 2013. The NPS specimens were submitted in 3 ml of VTM and tested as part of routine clinical practice with a molecular assay that detects a panel of respiratory viruses (RP), including Influenza A, A-1, A-3, and B. During the study period, 3,675 NPS specimens were submitted to the MSKCC clinical laboratory for testing. Of those specimens, 45, 425, 37, and 77 tested positive for influenza viruses A-1, A-3, A-un-subtypable (A-u), and B, respectively with the RP. A total of 360 positive specimens, 40 samples from each of the influenza subtypes, and 37 A-u. In addition, 1-2 negative samples that arrived to the laboratory immediately before or after each of the positive specimens were chosen for subsequent testing with the influenza A and B assay. 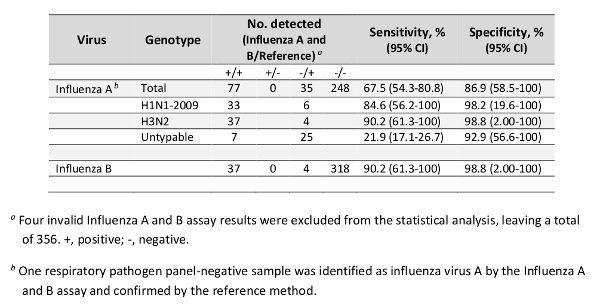 In total, the Influenza A and B assay detected 79 influenza virus A, 37 influenza virus B, 240 negative, and 4 invalid results (failure of internal controls) (Table 1). There were 46 discrepant results with 44 samples positive on RP only and two positive on the Influenza A and B assay only. A third molecular-based influenza assay was performed on the 44 discordant specimens which detected 33/43 (8 influenza virus A, 21 A-u, and 2 influenza virus B) that were positive by the RP and 0/1 positive (influenza virus A) by the Influenza A and B assay. An agreement between two or more assays was considered an accurate identification. The overall Influenza A and B assay sensitivity for total influenza virus A was 67.5% (95% CI (CI), 56.6-78.5). The sensitivity for the influenza A subtypes was A-1, 84.6% (CI, 58.5-100), A-3, 90.2% (CI, 62.8-100), and A-u, 21.9% (CI, 19.6-24.1). The overall specificity for the influenza virus A was 86.9% (CI, 71.0-100). For influenza virus B testing, the sensitivity and specificity were 90.2% (CI, 68.5-100) and 98.8% (CI, 68.5-100), respectively. Overall, the mean CT values in specimens with discordant results were significantly higher than those obtained for concordant results (16.4 ± 0.48 vs. 25.7 ± 0.51; p >0.000) (Figure 1). Figure 1: Average CT values determined by RP assay for samples that were positive and negative, respectively by the assay for each influenza subtype. Error bars represent standard deviation. **, p <0.01; ***, p <0.001. Please click here to view a larger version of this figure. Table 1: Performance of the Influenza A&B on VTM specimens compared to reference results. Influenza viruses are significant world-wide causes of morbidity and mortality. Rapid and accurate diagnosis of influenza is one of the major keys to managing flu outbreaks during respiratory season. Other antigen-based tests are rapid and easy to perform; however, they have low sensitivities13. On the other hand, traditional molecular tests have improved sensitivity, but require more experienced laboratory technologists to perform and are more costly. The Influenza A and B assay described in this study and protocol is a CLIA-waived, rapid molecular test for Influenza A and B. The technology is based on an isothermal-amplification for the detection and differentiation of influenza viruses A and B. We show representative results to demonstrate the performance of the influenza A and B assay on a panel of archived, frozen NPS VTM samples was evaluated as compared to another molecular-based respiratory panel assay. The samples that were determined to be "equivocal" or "untypeable" by the RP test had the lowest sensitivity by the Influenza A and B assay. In addition, discordant results were observed more frequently for specimens with higher CT values in RP assays, suggesting that the lower detection rate by the assay was associated with the lower viral titers. The assay had an improved performance for the detection on influenza virus B over influenza virus A detection with a 90.2% sensitivity and 98.1% specificity. The results here are consistent with previously published literature26,27,28. This study has two important limitations. First, samples were stored in VTM for testing on the platform. However, at the time the samples were tested, the platform did not have FDA approval for this sample type. Therefore, the dilution into VTM, may have reduced the detection of low-titer VTM samples. Second, the specimens that were tested with the Influenza A and B assay had been stored at -70 °C for 6 to 9 months prior to testing whereas the RP testing was done on fresh specimens immediately after they were received. It is possible that freezing the specimens further reduced influenza detection in the samples. The influenza A & B assay has few steps and is simple to perform. However, there are two key steps that must be completed appropriately and that users can troubleshoot if they experience errors. First, when initially setting up the assay, the transfer cartridge must be connected to the test base until they click into place. If these two pieces are not secured appropriately, the run will fail and will need to be repeated from the beginning. Second, the instrument needs to warm up for 2 min prior to adding the sample. After this warm up time, users have 30 sec to add the sample, connect the transfer cartridge to the test base, and close the lid. If the time passes before this step is complete, the instrument will fail the run and the sample set up will have to be repeated from the beginning. The limitations of the assay include slightly increased hands-on time and lower sensitivity compared to the respiratory panel and does not subtype influenza A. Further, the only specimen types that can be used with the assay are nasopharyngeal swabs or the NPS that are stored in viral transport media; the performance of the assay for any other specimen type, such as lower respiratory specimens, has not been evaluated. It is important to note that all of the steps in this protocol are critical. Any modifications or deviation from the protocol as written may result in lower performance or of the assay and must be assessed by the user. The benefit of the technology is that the instrument has a small footprint, only takes 15 min to perform and, even though the technology is based on molecular methods, does not require special training or qualifications to perform. The Influenza A and B assay evaluated in this study has the potential to serve as an alternative to RIDTs for the diagnosis of influenza. The system has the advantage of a short total test time, has a small footprint and is easy to use. Overall, the design of the instrument is suitable for point-of-care testing. We thank the Clinical Microbiology Service staff of the Memorial Sloan-Kettering Cancer Center for help in collecting clinical specimens. This study was supported in part by a research agreement between MSKCC and Alere Scarborough (SK2013-0262). Prevention control of seasonal influenza with vaccines. Recommendations of the Advisory Committee on Immunization Practices--United States, 2013-2014. Report No. 1057-5987 1-43 (2013). Poehling, K. A., et al. The Underrecognized Burden of Influenza in Young Children. New England Journal of Medicine. 355, (1), 31-40 (2006). Estimates of Deaths Associated with Seasonal Influenza --- United States, 1976-2007. MMWR. 59, (33), 1057-1089 (2010). Agrawal, A. S., et al. Comparative evaluation of real-time PCR and conventional RT-PCR during a 2 year surveillance for influenza and respiratory syncytial virus among children with acute respiratory infections in Kolkata, India, reveals a distinct seasonality of infection. Journal of Medical Microbiology. 58, (12), 1616-1622 (2009). Ginocchio, C. C. Strengths and Weaknesses of FDA-Approved/Cleared Diagnostic Devices for the Molecular Detection of Respiratory Pathogens. Clinical Infectious Diseases. 52, suppl 4 312-325 (2011). Grohskopf, L. A., et al. Prevention and control of seasonal influenza with vaccines: recommendations of the Advisory Committee on Immunization Practices-United States, 2013-2014. MMWR Recomm Rep. 62, (07), 1-43 (2013). Molinari, N. -A. M., et al. The annual impact of seasonal influenza in the US: measuring disease burden and costs. Vaccine. 25, (27), 5086-5096 (2007). Aoki, F. Y., et al. Early administration of oral oseltamivir increases the benefits of influenza treatment. Journal of Antimicrobial Chemotherapy. 51, (1), 123-129 (2003). Noyola, D. E., Demmler, G. J. Effect of rapid diagnosis on management of influenza A infections. The Pediatric infectious disease journal. 19, (4), 303-307 (2000). Sharma, V., Dowd, M., Slaughter, A. J., Simon, S. D. EFfect of rapid diagnosis of influenza virus type a on the emergency department management of febrile infants and toddlers. Archives of Pediatrics & Adolescent Medicine. 156, (1), 41-43 (2002). Dale, S. E., Mayer, C., Mayer, M. C., Menegus, M. A. Analytical and clinical sensitivity of the 3M rapid detection influenza A+B assay. J Clin Microbiol. 46, (11), 3804-3807 (2008). van Doorn, H. R., et al. Clinical validation of a point-of-care multiplexed in vitro immunoassay using monoclonal antibodies (the MSD influenza test) in four hospitals in Vietnam. J Clin Microbiol. 50, (5), 1621-1625 (2012). Hurt, A. C., Alexander, R., Hibbert, J., Deed, N., Barr, I. G. Performance of six influenza rapid tests in detecting human influenza in clinical specimens. Journal of Clinical Virology. 39, (2), 132-135 (2007). Fiore, A. E., et al. Antiviral agents for the treatment and chemoprophylaxis of influenza --- recommendations of the Advisory Committee on Immunization Practices (ACIP). MMWR Recomm Rep. 60, (1), 1-24 (2011). Harper, S. A., et al. Seasonal influenza in adults and children--diagnosis, treatment, chemoprophylaxis, and institutional outbreak management: clinical practice guidelines of the Infectious Diseases Society of America. Clin Infect Dis. 48, (8), 1003-1032 (2009). Hannoun, C., Tumova, B. Survey on influenza laboratory diagnostic and surveillance methods in Europe. European Journal of Epidemiology. 16, (3), 217-222 (2000). Leonardi, G. P. Rapid identification of 2009 H1N1 influenza A virus using fluorescent antibody methods. Am J Clin Pathol. 134, (6), 910-914 (2010). Chartrand, C., Leeflang, M. M. G., Minion, J., Brewer, T., Pai, M. Accuracy of Rapid Influenza Diagnostic TestsA Meta-analysis. Annals of Internal Medicine. 156, (7), 500-511 (2012). Lee, G. C., et al. Evaluation of a rapid diagnostic test, NanoSign(R) Influenza A/B Antigen, for detection of the 2009 pandemic influenza A/H1N1 viruses. Virol J. 7, 244 (2010). Tang, Y. W., et al. Clinical accuracy of a PLEX-ID flu device for simultaneous detection and identification of influenza viruses A and B. J Clin Microbiol. 51, (1), 40-45 (2013). Bandt, D., et al. Economic high-throughput-identification of influenza A subtypes from clinical specimens with a DNA-oligonucleotide microarray in an outbreak situation. Molecular and Cellular Probes. 26, (1), 6-10 (2012). Pierce, V. M., Elkan, M., Leet, M., McGowan, K. L., Hodinka, R. L. Comparison of the Idaho Technology FilmArray system to real-time PCR for detection of respiratory pathogens in children. J Clin Microbiol. 50, (2), 364-371 (2012). Teo, J., et al. VereFlu™: an integrated multiplex RT-PCR and microarray assay for rapid detection and identification of human influenza A and B viruses using lab-on-chip technology. Archives of Virology. 156, (8), 1371-1378 (2011). Babady, N. E., et al. Comparison of the Luminex xTAG RVP Fast assay and the Idaho Technology FilmArray RP assay for detection of respiratory viruses in pediatric patients at a cancer hospital. J Clin Microbiol. 50, (7), 2282-2288 (2012). Chidlow, G., et al. Duplex real-time reverse transcriptase PCR assays for rapid detection and identification of pandemic (H1N1) 2009 and seasonal influenza A/H1, A/H3, and B viruses. J Clin Microbiol. 48, (3), 862-866 (2010). Bell, J. J., Selvarangan, R. Evaluation of the Alere I influenza A&B nucleic acid amplification test by use of respiratory specimens collected in viral transport medium. J Clin Microbiol. 52, (11), 3992-3995 (2014). Nie, S., et al. Evaluation of Alere i Influenza A&B for Rapid Detection of Influenza Viruses A and B. Journal of Clinical Microbiology. 52, (9), 3339-3344 (2014). Chapin, K. C., Flores-Cortez, E. J. Performance of the Molecular Alere i Influenza A&B Test Compared to That of the Xpert Flu A/B Assay. Journal of Clinical Microbiology. 53, (2), 706-709 (2015).